EBL Construction, a division of EBL Partners, an established construction and project management firm based in Naples, has substantially completed the Immokalee Middle School Shelter Project. The project was completed November 5 – on schedule and with no change orders to the owner. The certificate of occupancy was issued on November 16. The shelter enhancement project included an expansion to the Immokalee Middle School cafeteria bathroom. The bathrooms in the cafeteria of the Immokalee Middle School were not large enough to accommodate the amount of persons that would be restricted inside during a storm. Expanding the bathroom facilities in this area of the school allow the facility to accommodate and contribute to the health and safety of those using the shelter. 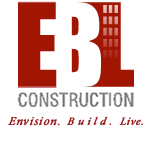 EBL Construction is located at 1482 Rail Head Boulevard, in Naples. For more information, call 239-431-5003 or visit www.eblpartners.com.